Pick up the cup and drink from anywhere along the rim! Innovative design that provides spill free, worry free and hassle free drinks in a car, plane, around the home. 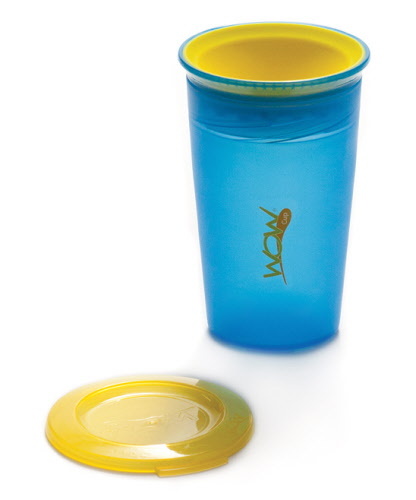 The Wow Cup provides an effective and healthy alternative to a sippy or straw cup. Perfect for parents wanting a simple solution for transitioning to an open cup or just as an everyday kids fun cup! The 360° Uni-Flow™ drinking edge assists toddlers develop the oral and motor coordination to transition into a regular open round cup sooner and should reduce the "fun" of dealing with spills and many training sessions. 360 Drinking Edge - drink anywhere from the innovative Uni-Flow drinking edge. Spill Free - the patented Even Seal technology automatically seals the cup when not sipping. No spouts, levers or buttons. BPA, Phthalate and PVC free. Dishwasher safe - easy and safe to clean. Supports natural oral development - assists in the prevention of potential Orthodontia issues due to long term sucking on spouts. 1. Clean thoroughly before using. 2. Fill the Wow Cup® with your favorite beverage. We do not recommend carbonated and hot beverages. If using juice with pulp, it is recommended you strain the juice before pouring into the cup. 3. 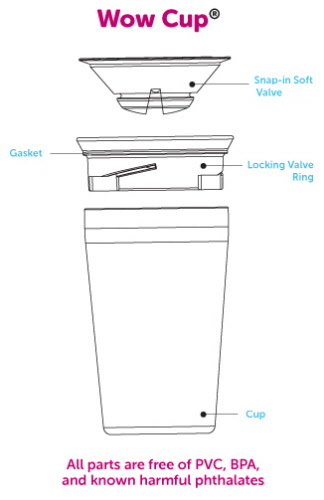 After filling with desired amount below the valve ring, Snap the valve into the locking valve ring and then Twist the valve ring onto the cup. Make sure the valve ring is securely tightened before giving the Wow Cup® to your child. 4. The Wow Cup® is made from durable plastics that are food safe and will last a long time under normal usage conditions. However, it is recommended you examine your cup before giving the cup to your child. Dispose of any components if they show any signs of tears or breakage. 6. 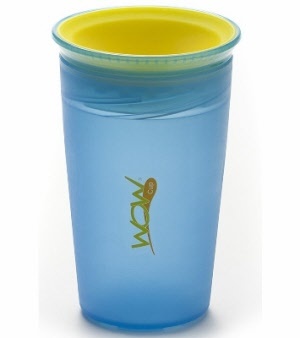 The Wow Cup® is refrigerator safe and ice cube friendly. 7. Clean after each use. 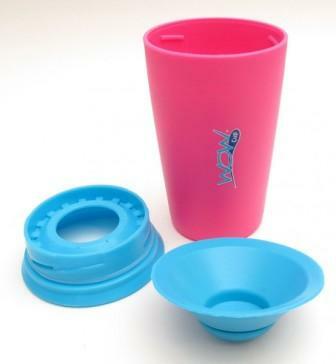 The Wow Cup® is easy and simple to clean. It is recommended you clean before use and immediately after use. Fully disassemble all 3 main parts (the Silicone snap-in valve, the plastic locking valve ring and the cup)before washing. All three parts need to be removed for cleaning. If hand washing use clean hands and surfaces and wash in warm, soapy water. All the components can be washed in the dishwasher using a delicate wash cycle and placed on a top rack (This cleaning is more aggressive and over time the colors could fade). Also, make sure the parts are away from the dishwasher heating elements during drying. Always rinse the components thoroughly after each wash. Hand or air dry after washing by hand.